Truth Aquatics' dive boat Conception. Conception (#) (1981+), 78-foot commercial dive boat built in Long Beach, that operates out of Santa Barbara, and is owned by Glen Fritzler, Truth Aquatics Inc. It can accommodate 46 people maximum, and has 13 double bunks and 20 single bunks. It has a range of 800 nautical miles. 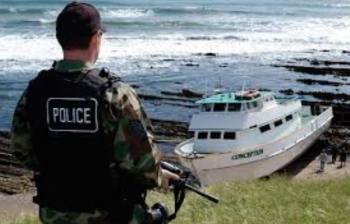 March 25, 2005 [Lompoc Record]: “A man described as a homeless drifter has been arrested in connection with the theft of a large commercial dive boat stolen early Wednesday morning from the Santa Barbara Harbor. Donald Patrick Kelley, 41, is believed to be a drifter who recently arrived in Santa Barbara, police said. Kelley is suspected of stealing the Conception and sailing it north to where it was beached at a remote section of Vandenberg Air Force Base. The errant captain damaged three other boats, sinking one, before leaving the Santa Barbara Harbor. Military security found Kelley within one-quarter mile of the vessel and detained him for Santa Barbara Police, who reportedly found food items believed stolen from the Conception's galley. This page was last edited on 25 August 2017, at 18:48.